Baby spinach (to cook with the noodles). 1. Add all ingredients except baby spinach into boiling water & cook for 30 mins. 2. Then turn to low heat & simmer for at least 3 hrs. 1. Mix the flour & salt in a mixing bowl. Make a well in the center, break the egg into the well, pour in the oil & water, and stir with a spoon until the dough begins to come together. Knead until fully combined. 2. Turn out the dough onto a lightly floured surface and knead until smooth. Cover the dough with a damp cloth or cling wrap. Let the dough rest for an hour before use. 3. After 1 hr, divide the dough into smaller portions for easier rolling. 4. Roll out each portion of dough on a lightly floured surface to about 0.1cm thick. Bring a large pot of broth to boil when you almost done with rolling. 5. Lightly floured each side of the dough. Cut the dough into flat noodle pieces by using a cutter or a knife. This can avoid mess from tearing the dough. 6. Lightly dust flat noodles with flour to prevent sticking. Put cut flat noodles in a big bowl. 7. Turn heat to low. Add flat noodles & stir occasionally while you add the flat noodles to avoid sticking. 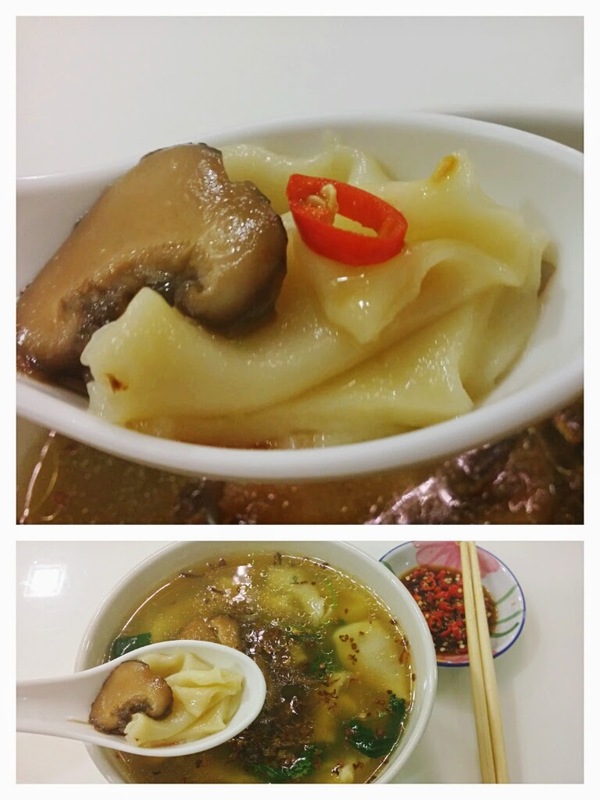 Once you have drop all flat noodles into the soup, turn heat to high and let them cook until they float on top. 8. Add veggie and continue to simmer for about 30 seconds to a minute. 9. Garnish with fried ginger, seasoned mushroom and vegetarian crispy sliced. Serve with bird's eye chilies in soy sauce. 1) Some ginger, finely chop & fried. Set aside. 2) Some shiitake mushroom, sliced. Stir-fry and add in 1 tsp of vegetarian mushroom sauce & soya sauce. A dash of pepper & some water. Done.